Want to say a big Congratulations to OB'S Customs on the coverage in the new Hot VWS this month. 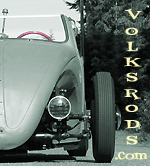 Nice to see another Volksrodder in the magazine. Last edited by Timbo; December 27th, 2018 at 08:07 AM. Re: Congrats to OB'S Customs. Haven't seen an HVWs mag in a while, but will have to go try and find this one. OB's ride is for sure feature quality ! Cool. Mines still in the wrapper. Got it today. Can’t wait to check it out. Great, now I'll have to hang out in the cold by the mailbox tomorrow. Congrats' I really enjoy the magazine. Hey Thanks guys! I was super excited about this! Then out of nowhere I had a hot rod guy make a crazy offer and I couldn't say no. As of 2 weeks ago it went to a new home. The hunt has started for the next project...69 or earlier Notch or maybe a fastback to volksrod. Good to hear that you got a crazy offer, HVW's can do that, I sold mine within a month of HVW's and got a crazy offer as well. Now looking forward to seeing your next project. Congratulations on your well deserved fame and fortune! I always thought that a Ghia morphed into a Merc sled would be cool. Makes perfect sense to me as well. Thought about trying it myself. Ghia bodies are kinda high priced for me to experiment on like that... the roof line is already the right shape (or very close) so most of it will be the nose and the tail and the body lines down each side. Now I guess I'll hafta get myself a copy of the magazine, can't seem to find it anywhere around here.